World trade and liberalization have been highly damaging local food systems converting the food production system towards industrialization and globalization. Hence, amounts of food imported to developing countries have increased, agribusiness and the production of agricultural commodities delivered to agro-industries for processing and subsequent distribution through retail chains have been empowered, and small scale farmers have been seriously marginalized. - Our traditional food diets and culinary heritage are threatened and are gradually fading away. - Agribusiness, retail chains, and food imports are increasing rates of food loss. According to FAO, about one third of the food produced in the world for human consumption every year gets lost or wasted, and recovering only half of what is wasted can resolve the issue of hunger around the world. - The global food system is one of the biggest drivers of climate change as it results in emitting over one third of all global greenhouse gas emissions of which livestock represents the biggest portion. According to GRAIN, it is the industrial meat and dairy complex that produces this tremendous damage through deforestation, industrial feed crops, use of chemical fertilizers, manure lagoons, transport and refrigeration, and massive waste. In addition, air-freighted fruit & vegetables emit 33 times more carbon than locally-sourced produce. - Finally, the farming practices adopted by agribusiness and the processing procedures followed by agro-industries have a serious impact not only on the environment, but also on people’s health by exposing them to toxic chemicals and decreasing their minerals and vitamins intake hence increasing sicknesses and malnutrition. In order to sustain our existence and the survival of our Planet, it is important to examine and modify our global food systems into more localized ones. 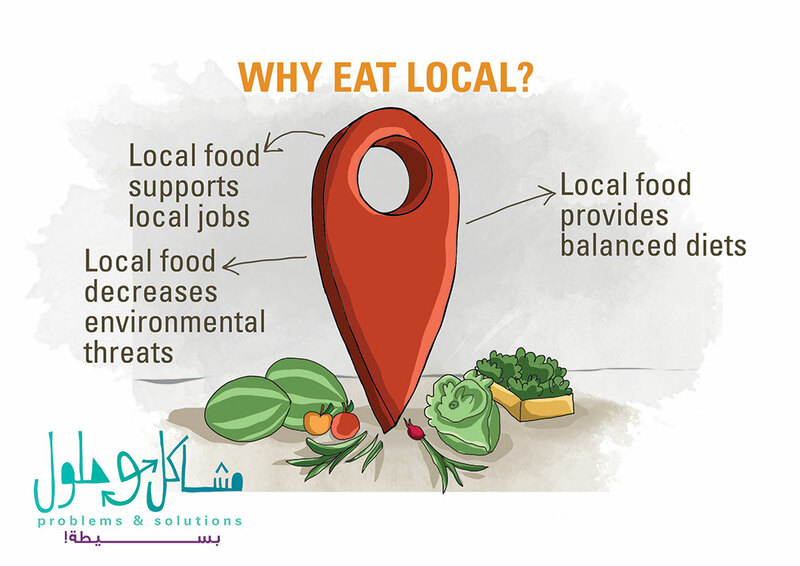 Local Food System is a system in which the production, processing, trading & consumption primarily of organic & sustainable forms of food production, are integrated to promote the environmental, economic, social & nutritional health of a specific area. - benefiting the environment especially that more eco-friendly farming techniques (organic methods, agroecological practices…) are adopted by local farmers; reducing the amount of greenhouse gas emissions at the level of transportation processes; and conserving biodiversity. It is essential that we change our consumption patterns, buy more healthy local food, and support local farmers who by adopting mixed, multi-functional and biodiverse small scale production systems aid in enhancing climate resilience, improving soil health, and resulting in diverse positive environmental and public health benefits. LET’S SAVE OUR CULINARY HERITAGE!! Our culinary heritage is fading away in the face of global food systems. We must strive to revive it as it represents an important part of our national identity. Farmer’s market, food tourism projects and community kitchen projects offer consumers, especially urban people, access to traditional farm products and traditional dishes. Categorizing all traditional food products according to their health and nutritional benefits and documenting them in books would as well aid in promoting them. It is also very important to aware the young generation about the importance of traditional foods for a healthy and sound body. It is very important to follow food safety standards / hygiene in cooking for the sake of public health and for a better promotion of your healthy traditional food. Eco-friendly farming techniques such as agroecological methods or organic farming reduce input expenses and diversifies income sources while stopping environmental degradation and improving resilience. If adopted properly such techniques can result in the same amount of yield as conventional methods while increasing your incomes. These practices would eventually benefit the environment, the consumers’ health and your living. To increase the income of local farm communities, decrease environmental damages and feed the world, food loss and waste must be decreased through improving production planning, aligned with markets; promoting resource-efficient production and processing practices (e.g. plant organic, promote agroecological practices, adopting few traditional processing technologies include: Drying, fermenting, and pickling); improving preservation and packing technologies (e.g. 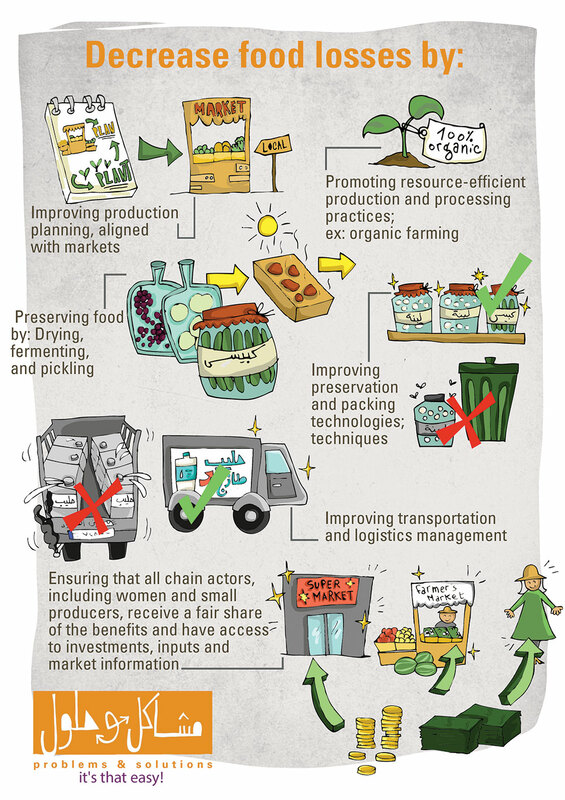 use clean, smooth and ventilated containers for packaging, adequate storage facilities and techniques); improving transportation and logistics management; ensuring that all chain actors, including women and small producers, receive a fair share of the benefits and have access to investments, inputs and market information. Many local plant and animal varieties are threatened with extinction due to our heavily reliance on mono-cropping and high yielding varieties. Local varieties are tastier, healthier and more resistant than high yielding hybrid varieties. We must produce more local culturally valuable species of plants and animals and hence preserve the agricultural heritage and biodiversity. As local and traditional food is much healthier and environmentally-friendly, consumption practices must be redirected towards these healthy diets. We must consume, cook, and promote more traditional local food. 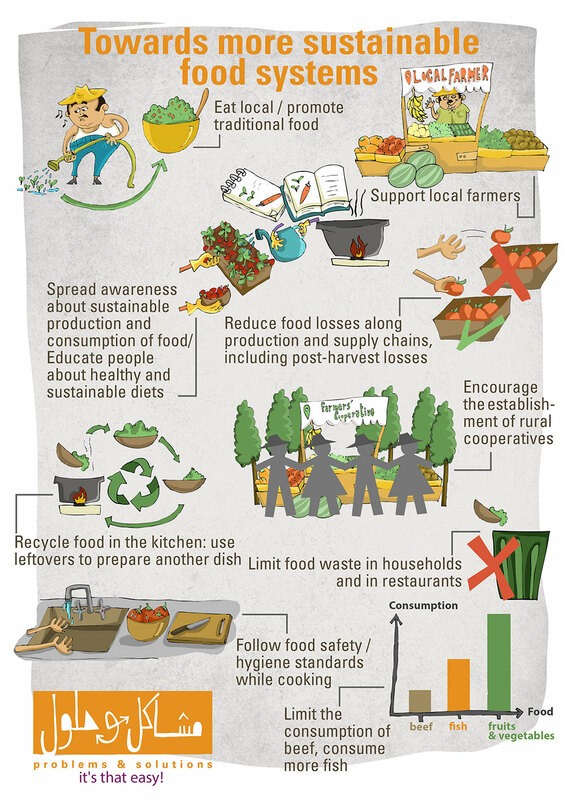 EAT LOCAL… PROTECT YOURSELF, LOCAL COMMUNITIES, AND THE WHOLE PLANET! !